Cliff Gaylor (Tobias) is a football player with an attitude. When his daughter Susan (Melissa Palmisano in her only screen credit) gets framed for having illegal drugs while on vacation in either a Caribbean or South American country (not really sure), and is imprisoned, Gaylor at first tries all the traditional channels to free her. He first goes to see his American Consul (Napier, here credited as “American Consul”) but he’s useless. He then goes to see a local lawyer (Balsam, credited as “Lawyer”), who also is incapable of helping him. So Gaylor then does the next natural thing: he calls his football coach (Borgnine, here credited as “Coach”. Sensing a pattern here?) - and gets his entire football team to stage a commando raid on the prison, but not before arming and training them in the usage of machine guns. Of course, the whole team agrees and Coach “coaches” the mission. But they’re going to have to get past sadistic prison warden Yashin (Silva) and his underling Prison Guard (Moldovan). Will the team be able to punt, spike, blitz, sack, snap, and tackle their way towards reaching their (field) goal? Find out today! 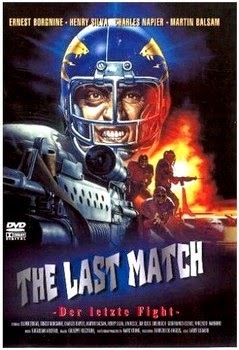 The Last Match had a lot going for it: a strong cast, an amazing concept, and the football players in full regalia brandishing machine guns and grenade launchers visually just looks awesome. Unfortunately, the movie only really kicks into high gear in the final third. Most of the movie is a staid and bland “My Daughter’s In Prison” drama with echoes of Midnight Express (1978). One thing Midnight Express did not have is a bunch of crazed footballers on the rampage shooting machine guns at Henry Silva while Ernest Borgnine happily gives instructions through a headset as to what to do next. Unless we blinked and missed that part. But because of the rarity of this movie, most people haven’t gotten to see the cast of Borgnine, Balsam, Silva, Napier, Moldovan, and the footballers do their thing so audiences can decide for themselves. Had this been released on VHS in America during the golden age of video stores, it might have had a shot at being a well-known cult movie. Now it’s just a not-so-well-known cult movie, which is only really justified by the last third. Also of note are the “whosh-whosh” sounds on the soundtrack that sound like someone is waving a piece of cardboard in the air, Borgnine being especially jovial about his wartime experiences, the evil drug dealer who has a shirt that says “NEWS”, and the subplot about saving an Elian-like kid from the third-world hellhole that is the unnamed country they’re trying to escape from. Also there’s a guy in the cast named Jim Kelly who’s a White guy and not the Jim Kelly we all know and love. So to recap, the country is unidentified, half the characters don’t have proper names, and the football team also has no name. We realize they didn’t have the budget to use an NFL team name, but it would have been funny if they had come up with an attempt, like the “New York Sharks” or something to that effect. But then again, the way it is is pretty funny. Another good thing about the movie is that the whole “Football Commandos” idea is played completely straight. It doesn’t appear that the filmmakers thought this was a wacky or ironic idea - they seemingly thought it was a perfectly sane concept for an action movie. And thank goodness for that. We get more than enough irony these days as it is. Just look at the training sequence where fully suited up football players shoot machine guns at targets. That’s why we keep going back to these Italian productions. They always seem to deliver in some way, shape or form. But the fact that a quality idea like this didn’t really take off to its full potential shows that by 1991 things were starting to run out of gas. Much like Martin Balsam, who gives a bizarre, stuttering performance in a complete sit-down role. He seems really confused as he reads his lines off a piece of paper. Compare that to Borgnine, who injects the movie with some much-needed energy during the interminable first and second portions. In the end, The Last Match has a killer concept, but ultimately doesn’t hit the mark. Or score a touchdown, if you will. Also check out a write-up from our buddies Outpost Zeta and Good Efficient Butchery! There's some fun moments towards the end...but most of the time it's pretty slow. This has been on my target list for awhile because it includes a classic exploding helicopter scene. You don't see many helicopters destroyed by someone punting a grenade into one. It is true, the premise is better than the film, but I could watch the scene of the football stuffed with a grenade, kicked into a helicopter that explodes over and over. Same here! Can watch that on an endless loop. Haha.